This narrative from the second chapter of John's Gospel tells about the first miracle that Jesus did. Not everyone believes that miracles can ever happen, so a illustration might help. Imagine a chess-board world. None of the chessmen, not even their kings and rulers, have ever seen anything outside the chessboard. A chessman who is a atheist (that is, a philosophical materialist, who does not believe there is anything but matter and energy) says "There is nothing and no one outside the chess-board. In fact, the word 'outside' is meaningless." Such a chessman would not believe in Chess-players and certainly not in a Chess-board maker. Nothing can happen except according to the rules of chess, and so miracles can never happen. Others do believe in what they cannot see, and are not surprised that sometimes things happen outside the normal rules, such as the black chessmen being replaced by red ones, or a bishop with a broken mitre suddenly disappearing and later coming back fully repaired. Nor will they be surprised when the chess-board is wiped clean, folded up and put away. Once a person accepts that the universe, including us, has a Creator, there is no logical barrier to believing in miracles. True, there are many bogus "miracles" around. This no more proves the impossibility of miracles any more than meeting many dishonest men proves there are no honest ones. It is significant that John starts his account in chapter 1 with the very first words from Genesis 1:1 "In the beginning ...", telling us that Jesus, the Living Word, is the very One who spoke the active word that caused the universe to spring into being. There in those early chapters we see something VERY GOOD (1:31) springing out of NOTHING at the command of God. We see PARADISE LOST because the first people, like proud chessmen, wanted to be their own masters, rather than trust the goodness of God. There we see God's great promise that one day One would come to lead men HOME at last. It is in this over-arching context that we should approach John chapter 2 (and all the rest of the Bible too). God had promised a rescuer, a saviour, a restorer. To the Jews, the descendants of Abraham, Isaac and Jacob (who was also named Israel) this One was known as "Messiah" (literally "anointed one" - One sent by God with power and authority to be the great, long-awaited, Restorer). Jesus was born, a "Nobody" in a minor town in a minor country. Yet angels announced him, and shepherds and wise men came to worship him. His very name means "God a Saviour". His mother, Mary, treasured up all these things in her heart, and wondered. Could this really be the Messiah, the SAVIOUR? Everyone said "What a good child!". As he grew, everyone said "What a good man! ", but still the world and people's hearts were in a mess. Is he really the one? Wedding day in Cana! Many guests invited to celebrate the day with the happy bride and groom (and for several days too! - this was an Eastern wedding). Mary and Jesus are invited (perhaps the wedding of close relatives, a cousin of Jesus? As we will see, Mary seems to have some role in managing the feast). Jesus' followers (probably Peter and Andrew, John, Philip and Nathaniel, and maybe John's brother James) are invited too, to swell the numbers, and because of the lavishness of Eastern hospitality. The guests have all washed their hands and feet (dusty travelling in those days) and the feast has been going along well. 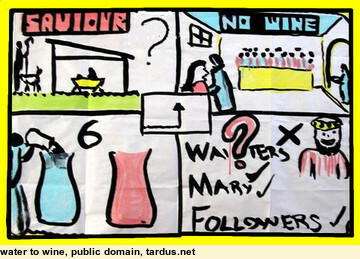 It is then that Mary draws Jesus aside and tells him quietly "They have NO WINE". The wine supply had run out! How embarrassing for the family when the quests and neighbours find out. A bad start to the marriage. Why such a bother? In those days they did not have tea and coffee, soft-drinks, or even cold milk (milk could not be kept for long without refrigeration). Mostly it was water or wine, and that often little better than vinegar. Why was Jesus at a wedding party anyway? He was a holy man wasn't he? To show us how much honour he places upon marriage, which was His own invention, a man and a woman joined together, fitting complements for each other, in love and mutual respect and support. That is the ideal, and it can be had, even in this fallen world. to show us that faith in God need not wear a sour face. There is nothing wrong with celebrating something good. Why did Mary tell Jesus? She had long thought over his miraculous birth. I think she well understood that he was Someone very special, and had an expectation that he would do something in this domestic catastrophe. Why did Jesus answer her as he did? "Woman, what does this have to do with me? My hour has not yet come." Firstly, he was not being rude when he addressed his mother as "Woman". He used the very same word when, at his crucifixion, he asked John to take care of her; "Dear Woman, here is your son" (while looking towards John). It is the same word he used in Matthew 15:28 when healing the widow's daughter "Woman, you have great faith! Your request is granted." Dear Woman is a pretty good translation in all these cases. Secondly, he did not say, as we might have expected, "Dear Mother"? I think he was saying that she must not expect him, as Messiah, to intervene for her just because she was his mother. She may only claim the same help from God as every other person (and that help is very great indeed). He would do no miracle, not for his earthly family, not even to feed himself, but only for his great task as Messiah, Saviour, Rescuer, Restorer. Lastly, I think he was saying that he alone, from now on, must decide when and how he was to act; "My hour has not yet come." Mary expects that Jesus will do something (what mother does not know her own son's character and speech?) so she tells the waiters at the feast "Do whatever he tells you". Now nearby were six large stone water-jars, of about 100 litres each. The water had been taken out earlier for the quest's washing of hands and feet. "Jesus said to the servants 'Fill the jars with water.' And they filled them up to the brim." "Water!" - perhaps they think "the guests have already washed". But they do as they had been told, and filled them up to the brim. This was a huge amount of water, and left no room for any "magic" tricks, such as later pouring in some concentrated, fortified, wine. Jesus did not even touch the water or the pots. Then Jesus said "Now draw some out and take it to the master of the feast." Here is a real challenge to their obedience. "What will the Master of Ceremonies say?". "We might lose our jobs." But they do it anyway. Good servants these! The best wine kept till last, or so the MC thinks. The wine is so good he is very surprised. He is used to things being the other way; the longer the feast goes, the worse the supplies get. Who is this, that plain old water obeys him? ... but the Master of Ceremonies did not know! Because God is lavish in His giving, as in Genesis 1, and so His Son, Jesus, must be lavish in His giving (and far more lavish later than six pots of the best wine). To leave no room for tricks. This was not a "magic" glass of wine, but 600 litres (about 150 gallons). Why the very best wine? - for the same reasons. And we see also that wine is not evil (it also is God's gift); it is drunkenness that leads to evil. God supplies the best, when our supplies are exhausted. His free grace over our self-effort. Heaven reverses the world's practice; "the best is yet to come". John wrote to show us the signs that point to who Jesus is. He who can bring something VERY GOOD out of next to NOTHING is the same who brought everything into being at the first. He who supplies lavishly for our not-so-urgent needs is the same Who supplied lavishly and lovingly at the first. He Who's glory shone out at the beginning shines out here too. "This, the first of his signs, Jesus did at Cana in Galilee, and manifested his glory." "And his disciples believed in him." They were sure that He was indeed the Messiah, the Christ, "and that by believing you may have life in his name". Everyone needs to look at this sign, and all the rest in the Gospels, to see if this is true. Nothing else really matters. Was the the first miracle that Jesus did? This happened after Andrew and Peter, Philip and Nathaniel and one other came to see Jesus in John chapter 1. Yet in Luke's account Jesus performed miracles of healing (Luke 4:31-41) before we hear of him calling his first disciples to follow him (Luke 5). Are these accounts contradictory, as some like to say? Is the Bible unreliable? We need to avoid the "literal" trap, that is, insisting that every word and phrase in the Bible be taken at its face value. We do not do that with any other literature (and the Bible is literature, though divinely inspired). We do not do that with in everyday speech. As an example, imagine you read in the newspaper "The first thing the newly elected government did was to abolish a hated tax." What, absolutely the first? Did not the political party that just came to power have a celebration first? Did not their leader first appoint key government officials? Of course they did. The newspaper meant "the first significant action of the new government". Now John wrote his Gospel account not as a biography of Jesus, but as a aid to readers to help them see who Jesus really is. In this he uses a number of miracles as "signs" (by my count 8 of them). He certainly does not try to list all of Jesus' miracles. Therefore it is quite reasonable to read verse 11 as "This, the first of his signs that I am showing to you so that you see who Jesus really is, Jesus did at Cana in Galilee, and manifested his glory. And his disciples believed in him." Secondly, we need to avoid reading into the text more than is clearly there. Is the account of the first disciples in Luke 5 the same as that in John 1? In John 1 we read of Jesus meeting some who later called his "disciples". In Luke we read of Jesus calling disciples to follow him. It may be that he already knew the men, perhaps from the time he me them in John 1, before he asked them to leave their occupations and follow him in his travels around Israel. Exactly what the answer is no one can say with certainty, but I hope I have shown that there can easily be an answer without having to say that the Bible is inaccurate. 2:1 On the third day there was a wedding at Cana in Galilee, and the mother of Jesus was there. 2 Jesus also was invited to the wedding with his disciples. 3 When the wine ran out, the mother of Jesus said to him, "They have no wine." 4 And Jesus said to her, "Woman, what does this have to do with me? My hour has not yet come." 5 His mother said to the servants, "Do whatever he tells you." 6 Now there were six stone water jars there for the Jewish rites of purification, each holding twenty or thirty gallons. 7 Jesus said to the servants, "Fill the jars with water." And they filled them up to the brim. 8 And he said to them, "Now draw some out and take it to the master of the feast." So they took it. 9 When the master of the feast tasted the water now become wine, and did not know where it came from (though the servants who had drawn the water knew), the master of the feast called the bridegroom 10 and said to him, "Everyone serves the good wine first, and when people have drunk freely, then the poor wine. But you have kept the good wine until now." 11 This, the first of his signs, Jesus did at Cana in Galilee, and manifested his glory. And his disciples believed in him.